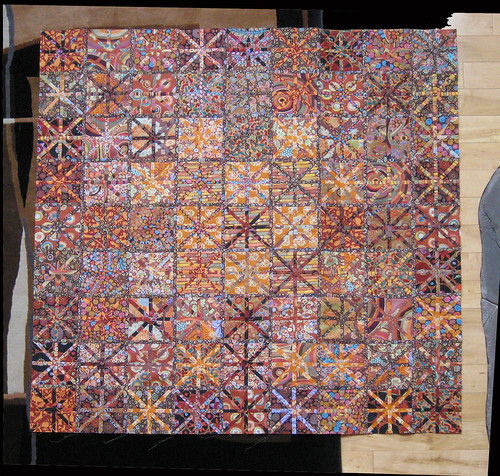 When I finished the center of the asterisk quilt, I took this photo with it placed on my living room floor(That’s rug to the left and hardwood and hearth to the right.). The problem I am having with this quilt is obvious: lack of good contrast between background fabrics and the insert fabrics. In this picture for instance, the inserts are barely discernible in some of the blocks. I deviated from the quilt shown in “Quiltmaker Magazine” by adding a 1/2 inch dark brown print sashing. The inserts are all 1/2 inch too, so this creates a sort of mosaic effect. I have yet to add two inner borders: one of the dark brown and another of 1/2 inch turquoise batik. Finally, I will add the large floral border. All the fabrics, with the exception of the turquoise, will be Kaffe Fasset fabrics. What a beautiful quilt top….I love it! !